We Love to find new and exciting places to share with all you lovely people, from the quirky to the classic we love exploring cities to bring you all the best places. We are also Afternoon Tea fanatics ! and are on a quest to travel the world bringing you all the afternoon teas we can find. Discover ‘Confessions of a Chocoholic’ afternoon tea. offering chocolate lovers a four-course feast of exquisite treats. Starting with freshly prepared open sandwiches, a tiered stand offering freshly baked chocolate chip scones served with chocolate praline spread, chocolate cupcakes and miniature chocolate fancies displayed on an edible chocolate plate. All delicacies are freshly made by he hotels pastry chefs with the finest quality ingredients, including delicious Valrhona chocolate, 70% cocoa and edible gold leaf. Teas from Harney & Sons have been specially blended for Hilton Hotels, from Earl Grey Tea infused with lavender and blue cornflowers to White Tea picked at dawn. Podium is delighted to be a member of The Tea Guild. Founded in 1985, The Tea Guild recognisesestablishments that serve tea to a high standard. This looks like a phenomenal tea! Especially that battenberg, it's whispering out to me! Hi there. Kelly Michelle mentioned that you had been too the Savoy for tea. Did you have it in rhe Thames Foyer or Beaumont Bar. What did you think? Thanks. 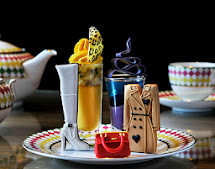 We had the Art Decadent Tea in the Beaufort bar, its a great afternoon tea! but very different to the traditional section offered in the Thames foyer. We would advise checking the menu first. We would also suggest trying the tradition afternoon tea at the savoy first. We will be putting up a review on the art decadent tea soon.